ant to know how to open OLM files on Windows machine? Get OLM Converter - An All-rounder OLM Exporter solution for exporting OLM files to multiple usable file formats. The tool supports to convert OLM data file to PST, PDF, EML, MSG, NSF, Office 365, MBOX, EMLX, RTF, DOC and HTML format. OLM File Exporter Tool is a simple to use application that even non-technical users find easy to use for performing OLM export to supported options. The tool supports to export OLM from Outlook 2011, 2016 Mac editions without even missing a single data. 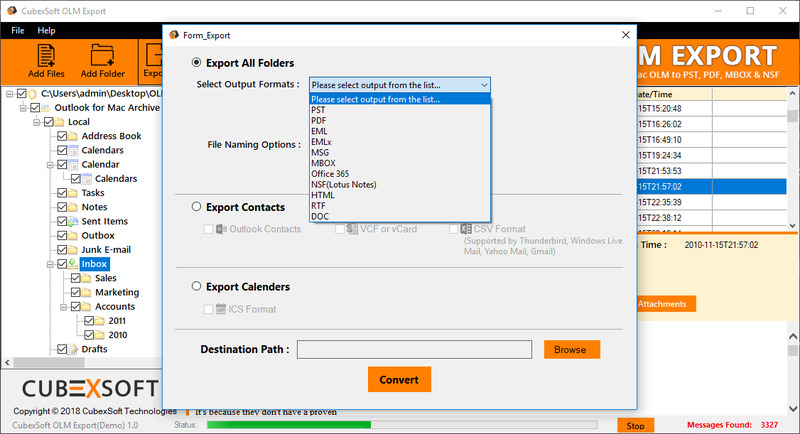 Add Folder option is one of the most highlighting feature of OLM File Explorer that allows users to perform OLM file import to any supported option in batch. OLM Export Tool also provides preview option which makes it a perfect OLM File Reader. Now get full access to read all your OLM files using OLM File Viewer for Windows utility. Being a Windows based application, OLM File Open Tool can be run on Windows system only. However, it supports all the earliest and latest Windows editions – 10, 8.1, 8, 7, Vista etc. With FREE OLM File Exporter Tool, users can get complete understanding of its working process. OLM File Converter Free demo edition allows conversion of first 20 emails from OLM files to PST, PDF, EML, NSF, Office 365 and other formats. Once getting complete satisfaction with the demo edition, you can purchase the licensed edition of OLM Export utility.